High school senior Justina Griffith was never the girl who dreamed of going to prom. Designer dresses and strappy heels? Not her thing. So she never expected her best friend, Ian Clark, to ask her. Ian, who always passed her the baseball bat handle first. But to get the whole story, Justina will have to face the boy who ditched her. And discover if losing out at prom can ultimately lead to true love. 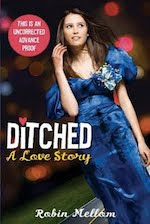 Filled with humor, charm, and romance, Ditched: A Love Story by debut novelist Robin Mellom will have readers dreaming of love on their own prom nights. This book sounds really cute and I love the cover when I saw it in May, even if it isn't final yet. I was this one on Netgalley and thought it looked really cute too. Great WOW choice! AHHH! This one sounds so cute and fun and I just want to wrap it in a hug! Will definitely be reading it when it comes out. Great pick!